RIT and Foodlink formalized their partnership, opening the door to new collaborations and student learning opportunities. 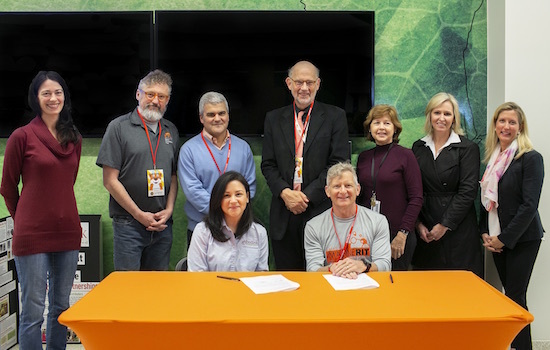 Jeremy Haefner, RIT provost, and Julia Tedesco, seated Foodlink executive director, seated left and right, signed a memorandum of understanding at the Imagine RIT: Innovation and Creativity Festival on April 28. Standing, left to right, are Enid Cardinal, RIT senior sustainability adviser; James Hall, RIT executive director of the School of Individualized Study; James Winebrake, RIT dean of the College of Liberal Arts; Dr. Daniel Ornt, RIT vice president/dean of the Institute/College of Health Sciences and Technology; Barbara Lohse, head of the RIT Wegmans School of Health and Nutrition; Meg Walbaum, experiential learning and community outreach coordinator in the School of Individualized Study; and Heather Newton, director of development and community engagement at Foodlink. Rochester Institute of Technology and Foodlink Inc. have signed a formal agreement, strengthening their partnership and creating opportunities for new collaborative efforts in the fight against hunger in the region. Jeremy Haefner, RIT provost, and Julia Tedesco, Foodlink executive director, signed a memorandum of understanding at the Imagine RIT: Innovation and Creativity Festival on April 28. The closer working relationship outlined in the agreement supports the development of mutually beneficial programming initiatives, opportunities for experiential learning for students via internship or co-ops, collaborative scholarship and grant proposals. A recent collaboration gave students and faculty in RIT’s Wegmans School of Health and Nutrition in the College of Health Sciences and Technology and the College of Liberal Arts an opportunity to pilot a federally funded program encouraging the purchase of vegetables at Foodlink’s Curbside Market. Attending the event were James Hall, executive director of RIT's School of Individualized Study; James Winebrake, dean of the College of Liberal Arts; Dr. Daniel Ornt, vice president/dean of the Institute/College of Health Sciences and Technology; and Heather Newton, director of development and community engagement at Foodlink. Foodlink is a regional food hub serving Allegany, Genesee, Livingston, Monroe, Ontario, Orleans, Seneca, Wayne, Wyoming and Yates counties. It distributes food to a network of human service agencies, serves meals through its commercial kitchen and offers more than 30 food-related programs. Last year, Foodlink distributed more than 17.4 million pounds of food—including 4.9 million pounds of produce—offered more than 200 nutrition education courses and created new access points for healthy foods in underserved communities.